The Birmingham and Watford Gap turnpike road crossed the valley of the E brook on an embankment or causeway known as The Dam. The land on the west side of The Dam was part of the Somerville Estate, and in 1869, to encourage development, it became the subject of a 94-year lease. Development was slow, and it was not until 1879 that there were sufficient shops to justify renaming the street as “The Parade”. The name, well-known as the main street of Leamington Spa since 1860, caught on, and new shops, such as Mrs. Taylor’s millinery, dress, and mantle-making business, proudly gave their address as “Parade”. The first building, on the corner of Park Road, was the Museum public house, opened in 1870, followed by a row of three and a further row of five, later numbered 4-18; at no. 8 Louis Bayliss opened The Tripe House in 1876. Bayliss grew up in Birmingham, where his father was a gun lock filer living in Lench Street. 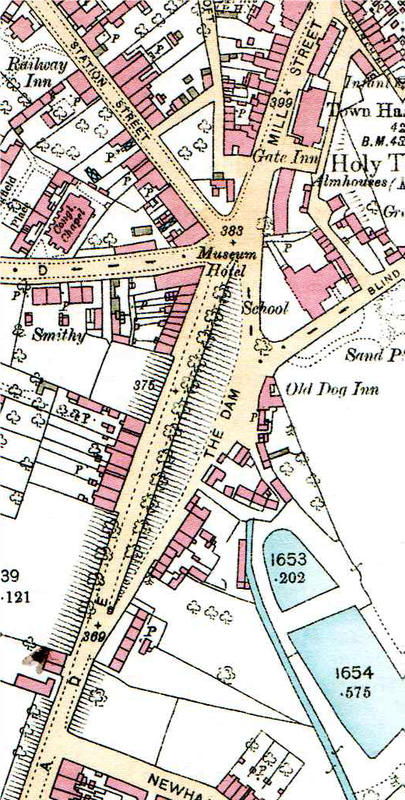 The 1871 census records Louis as a visitor at Sarah Insley’s house in Duke Street, Sutton Coldfield, where she lived with her daughter Mary. Mary was 24, according to the census, Louis 25, described as a butcher. The next census1881, shows Louis and Mary Bayliss living at the Parade, both aged 32, the eldest of their four children, Louis, was then nine years old, born in Sutton Coldfield. This suggests that Bayliss, who is described as a grocer, had moved to Sutton shortly after marrying Mary, and had a shop somewhere in Maney before moving to the Parade. An advertisement for The Tripe House in the 1901 directory announces “tripe and cow heels ready each evening at 6 p.m.” It was probably the equivalent of a fish-and-chip shop. Dressed tripe was a popular nutritious and cheap dish for the British working classes from Victorian times until the latter half of the 20th century, and cow heels were also a cheap and nourishing food. The shop also sold sausages, pork pies and “general confectionery”. Other shops soon opened. In 1880 there was Crisp’s boot and shoe stores, with sewing machines for sale or hire, 1881 saw the opening of Dunn Brothers, merchant tailors. A.J Rodway, tailor and hatter, set up in 1879, he was married with eight children and an apprentice, but the business failed and he was declared bankrupt in 1894 - he set up shop again in Erdington High Street. In 1885 John Harrison, butcher and Ann Higgs, fruiterer opened up, and then “J. Frank Parr, china glass and earthenware all at Birmingham prices”. These early shops were three storeys high, and included living accommodation for the shopkeeper’s family. The shop occupied the ground floor at street level, while the basement housed the kitchen, scullery and dining room, with French windows opening onto a yard, ground level at the back being much lower than street level. There would be a drawing room behind the shop, with bedrooms above. Ample accommodation for Louis Bayliss’s family - even room for a lodger (in 1881) or uncle James Insley (1901). This post-card view of the Parade in the 1920s shows the first block of three shops to be built, nos. 4 and 6 then occupied by Longmores, no. 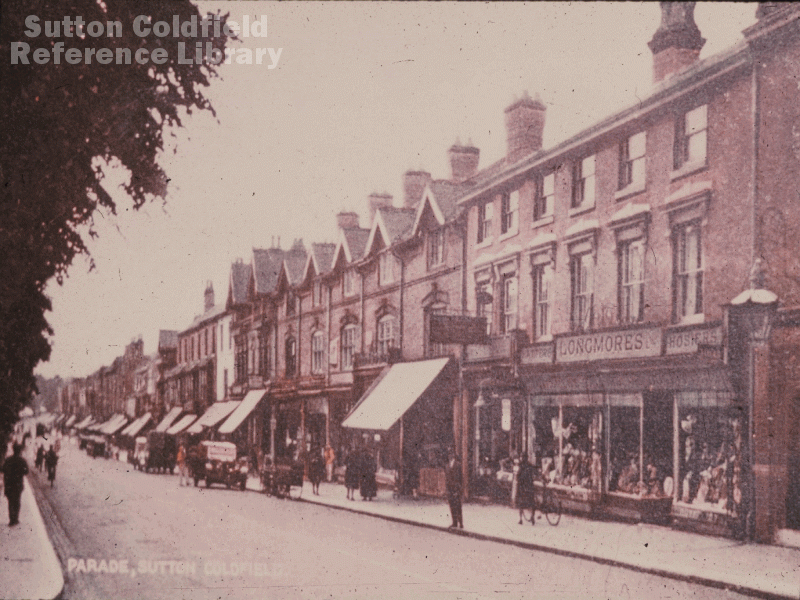 8, “Parade Café” is where the Tripe House used to be (Picture courtesy of Sutton Reference Library). 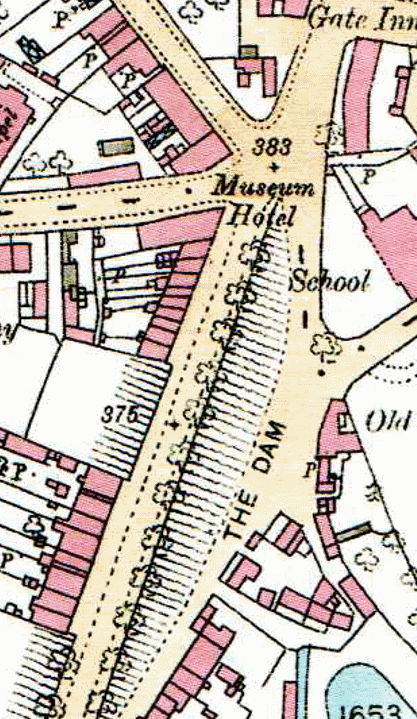 Detail of the 1886 OS map showing the Museum Hotel on the corner of Park Road and the Parade. Hachures show the steep sides of the embanked road where future shops would be developed - though the shops have all gone, many of the lime trees shown are still to be seen.